FLA Archives – A Write Old Life. If football fans want to become a political force, the next step is obvious. If you’ve ever read any of my books, you’ll know that one thing I’ve written about many times is the issue of fan power. Not just within the game itself, but as a potential political force. The problem of course, has always been how one would harness that power but it seems that finally, that problem has been overcome by the formation of the Football Lads Alliance. A group which might have it’s origins within the great game, but which has seemingly struck a chord with a wider section of society. One which up until recently had felt largely ignored; Middle England. I won’t go into what the FLA is all about (you can read more here) but the last march in London drew well in excess of 50,000 supporters (some estimated it to be closer to 60,000) from all over the UK and as we prepare to march again in Birmingham this Saturday (Gathering from 12.00 in Curzon Street and 12.30 in Victoria Square if you fancy coming along) I thought it might be worth sharing this extract from my book Barmy Army. First published in 2000, it discusses an idea which caused quite a stir when it was first mooted and that is the formation of a single issue political party. The Football Party. Times have obviously changed since I first wrote this and the concerns of the FLA certainly extend way beyond the confines of football but the general principle remains the same and it remains sound. The problem however, was always where to start but given what has been achieved by the FLA in such a short time in terms of generating both momentum and interest, that problem has already been circumnavigated. So the key question is what to do next. The answer is obvious. For if it is to make a genuine statement of intent, the clear target has to be the next round of mayoral elections which are due to take place in 2020. That might seem pie in the sky but before you dismiss the idea, consider these two simple facts. 1. Most of our major cities have more than one professional club within their boundaries with each generating sizeable and passionate support of a kind every political party would kill for. London alone, has 14 professional clubs within the M25. 2. Only 42.6% of the population of our capital voted at the last Mayoral election. In Manchester, the turnout in 2017 was just 28.9% of the electorate whilst in Liverpool, it was 26.1%. Indeed, the mayor of that great city was elected with just 171,176 votes (and for reference, 53,287 watched Liverpool hammer Watford on Saturday). If that’s not food for thought, I don’t know what is. So if we are to force action, then it must be done in a way which the clubs are unable to ignore. And in this country, every football fan over the age of 18 has something which those in authority have to take notice of. It’s called a vote. A few years ago, I suggested the formation of a single issue political lobby group called the Football Party. Initially, the suggestion was that people would stand for their local council to give fans a say in issues that directly affected their local club. It was an approach that proved astonishingly successful in 1990 when supporters of Charlton Athletic FC formed The Valley Party in an ultimately successful campaign to get the club back to their spiritual home. Such was the response, it quickly became apparent that many supporters believed that this local angle was an idea worth developing. But many people wrote to me and said we had to think big and aim higher. The more I thought about that, the more plausible the whole thing sounded. What finally convinced me that the concept of a national Football Party was a sound one was when I realised that the average local election generates a turnout of less that 40 per cent and that while over 12 million people voted for the Tories in the 1992 general election, approximately 25 million watched the England v Germany semi-final in Italia ’90. What this proved to me once and for all was that if you went canvassing around every pub, club, house and factory, and told the electorate that you were standing to give them a say within the football world, there’d undoubtedly be good support, and as soon as the established parties saw there were votes in it, their policies and actions would change so as to give football a kick up the arse. As a result, I sat down and wrote out a manifesto, one aimed not just at local councils but also at general and European elections. It included four main points. First, the formation of an independent, credible and properly funded body to represent the views and opinions of football supporters from every level of the game; second, the appointment of supporters’ representatives to the committees of both the Football Association and the Football Trust; third, the appointment of an elected supporters’ representative to the board of every professional football club; and finally, the appointment of an ombudsman or regulator to oversee the activities of the Football Association, the Football Trust, the Premier League and its members, the Football League and its members and supporters’ groups. In August 1998, when it was first released to the press and various supporters’ groups, the response was amazing. Yet sadly, the people I wanted to react, the football authorities and the government, paid it little heed. Undaunted, I carried on. More support poured in and the manifesto began to appear all over the Internet. I had enquiries about it from all over Europe and as far afield as Australia. It had certainly captured the imagination of supporters. However, the campaign eventually began to take its toll on me, both in terms of time and finances and I was forced to put it onto the back burner. But the idea is still very much alive and the very fact that so many people continue to respond to it proves that it is sound. It sure would rock the boat were it ever to come off. The mere idea that football fans throughout the country could even consider voting for a fat git like me proves how desperate they are to be involved in the game they love. Every supporter has a role to play in the future of the game, and that doesn’t just apply to the hooligan issue but to every single aspect of football. Every major political party recognises that fact – which is, after all, why Tony Blair does so many stupid photo-calls – but still they do nothing about it. That is not good enough. If football will not provide us with a properly funded platform through which we can be heard and demand answers, then the government must make sure they do. And if they don’t, that’s when we should use our vote, because that is the one thing all politicians are truly scared of. All we need to do is to get organised; but how we actually do that is anyone’s guess. Yet it has to happen. For only by wielding the immense power we as football fans have at our disposal will we ever see an end to the problems facing football, from the asset-stripping to the financial incompetence, greed and sheer hypocrisy of those who supposedly run our game on our behalf. For too long now they have got away with shafting us. They have placed us in danger, sold our very game from under our feet and in far too many cases to note here, have walked away with bank accounts bursting at the seams with money that came out of our pockets. It’s not right and the time has come to do something about it. If you want to read more on this, Barmy Army is available to download via this link. There is also more on the subject of football protest movement in my book, Rebellion which is available here. Two additional plugs, I’m still giving away ebooks versions of two of my best-selling books The Crew and Everywhere We Go. Further details can be found by clicking on the links or here Free Books where you will also find details of all my other publications. Aside from all that, work continues apace on developing the film version of Wings of a Sparrow as well as the thriller Three Greens and a couple of other movie projects. I’m also working hard on the third book in the The Crew/Top Dog trilogy. The Football Lads Alliance – Not right or left, just right. You may or may not have noticed given the lack of coverage in the mainstream media, but on Saturday 7th October, well in excess of 30,000 people from all corners of these Islands marched peacefully and relatively silently, through the centre of London. The Football Lads Alliance was on the move, and I am proud to say that I was one of them. Inevitably, the movement has come under all sorts of attacks from all kinds of places but I’m not going to respond to them here because I don’t have to. Not because it isn’t my place, which it isn’t, but because I’ve always believed that once you step onto the back foot, you’ve already lost the battle. Especially when it comes to people who have been suckered into the ‘left is right and right is always wrong’ mantra. I would however, like to talk about one aspect of this which rarely seems to be given any real attention and that is this: Using nothing more than social media, how did John Meighan, a relatively average Tottenham supporter manage to galvanise the world of football fandom to such an extent that supporters from every club in the UK and beyond were prepared to set aside rivalries and even outright hatred and walk together in almost perfect harmony? The answer is actually astonishingly simple. He merely took the first step and offered a voice to the politically disenfranchised. As soon as he’d done that, success was inevitable. What underpins that, and the thing which in many ways describes the USP of the FLA, is the fact that it isn’t being helmed by a Corbyn or Farage type figure with a self-serving agenda but is instead, headed up by one of us. A working class man who shares our experience, our discontent and our belief that as a strong and growing collective, we are finally starting to develop not just a voice, but something else that has been suppressed for far too long; pride. Indeed, the one word I heard over and over again on Saturday was proud. Proud of being there, proud of being a part of something and proud of being British. What happens next is down to the main man but whatever, whenever and wherever it is, the message to the British government will be the same. Whatever the source, whatever the warped idealism or motivation, whoever the target and whatever the cost, the time has come for the authorities to stop pandering to the snowflakes and take the fight to the enemy in our midst. Stop them, whatever it takes. I’ll be there, with tens of thousands of others. Front and centre, proud as punch. The Football Lads Alliance – Are Middle England finally on the march? As you may or may not have noticed, I have been quiet of late. To be honest, much of this has been to do with the fact that I’ve become so pissed off with the state of this country and the continuing failure to deliver Brexit that I was worried that if I went on a rant, I’d be unable to restrain myself and would carry on until I wrote something which would end up with me sitting in a cell somewhere. OK, that’s not strictly true. The truth is that I stopped blogging about the political landscape because I was becoming increasingly frustrated. Let’s face it, things are so screwed up at the moment that the hardest part about ranting about it is knowing where to start let alone stop. I mean, Sadiq Khan…. seriously? So I have instead been channeling my angst into various projects and dragging them to the point where they’re a rewrite away from launch. These include Billy’s Log 2, the third book in the The Crew/Top Dog trilogy and a new script I’ve been working on with a lawyer chum of mine about the power of the universe. Indeed, this last project has been especially interesting of late especially for someone like me who enjoys a bit of karma. Something which will become even more evident fairly shortly. However, and if you’re a regular reader of this blog you’ll know that there is always a however, my enthusiasm for the future of my country has been rekindled. For next Saturday (7th) I’ll be one of many tens of thousands marching in London to protest against this governments continuing failure to confront extremist terrorism in our country. 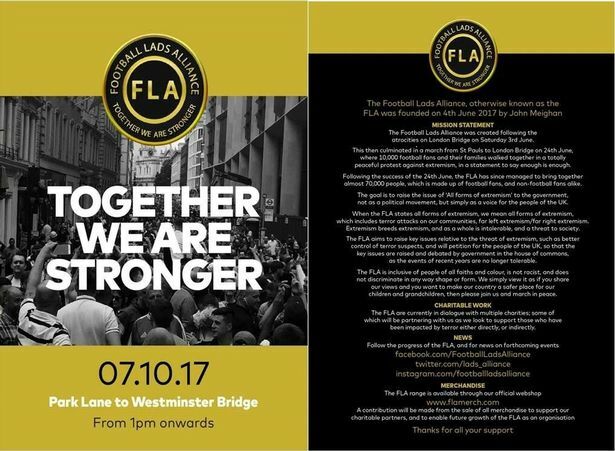 Yes, the Football Lads Alliance are taking to the streets again, and this time, the ranks will be swelled by a large contingent from the veteran community. I’m not going to go too deeply into the specifics here (if you want them, click here) other than to say that despite what certain factions are attempting to claim, the Football Lads Alliance is neither political nor racist. Indeed, it’s fairly safe to say that from day one the leadership have been at pains to create a totally inclusive movement by weeding out anyone who might have anything other than the core message at heart. I certainly wouldn’t be involved were that not the case but here I am. So if, like me, you’ve become sick of hearing that the only way to combat terrorism is to be reactive, if you’re angry at photo’s of dead children on the front pages, tired of hashtags, vigils and coloured lights on the Wembley Arch and increasingly frustrated at the governments reluctance to go on the offensive against this cancer which exists amongst us, then come and join me. It’s time for the silent majority to take a stand. Front and centre.